The Shawl Ministry at Church of the Holy Spirit was started by Deacon Johnine Byrer in Sept. 2004 and continues to thrive, with 150-200 shawls being distributed every year. Prayer Shawls are made by volunteers – this ministry is open to all; men and women, the young and less young, experienced and novice. Shawls and lap blankets are knitted or crocheted but no experience is needed. We can teach! The process is meditative and the maker thinks of the recipient, known or unknown, and incorporates their prayers and blessings into the shawl as they create a shawl. It can be done while watching TV, travelling, or just about anytime, anyplace! Shawls and lap blankets are made and given for many reasons. Often they are given to someone who has experienced a loss or an illness, but they are also given for happy occasions such as the birth of a child, a wedding or baptism. Many prayers are entwined in the stitches throughout the creation process and each shawl is blessed before being sent on its way. Please consider being a part of this wonderful ministry. We hope you will share a bit of your time and creative talents. If you already know how to knit or crochet, you can jump right in! Shawls can be triangular (my favorite), rectangular or square. The latter are particularly useful as lap blankets. Patterns can be found online at many locations, including http://www.shawlministry.com/, or check Amazon for “shawl ministry” books. 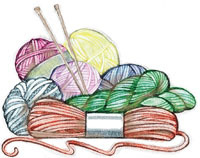 If you do not know how to knit or crochet, or need a refresher course, please come to Knit and Chat and we will teach! This is a time to gather, work on current projects or learn new skills. We have yarn, hooks and needles available. We’ve been a little lax over the winter months and hope to resume a regular schedule beginning May 1st. 2nd & 4th Monday mornings, 10 am-noon in the St. Martin room., across the hall from the office, CHS lower level.